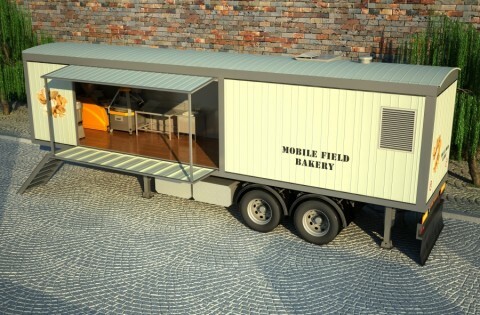 The field mobile bakery is intended for satisfaction of needs of armed forces and use in places of natural disasters. With its help it is possible to organize production of fresh and tasty bakery products far from communications. Mobile bakeries have an appearance of containers from 20 to 40 pounds in size, but in case of need execution in other overall dimensions is possible. Bakeries are set on the car or a brake fitting. Construction of a field bakery completely folding, its dismantling is possible thanks to what it is convenient to transport it on long distances without risk to damage the equipment. In mobile bakeries furnaces of different types can be used. Also they are completed with all equipment, necessary for production: kneader, machines for division and rounding of the test, etc. The energy necessary for operation of machines is made by the powerful generator. The tank for a water-supply, and also a container for storage of spare parts is provided.